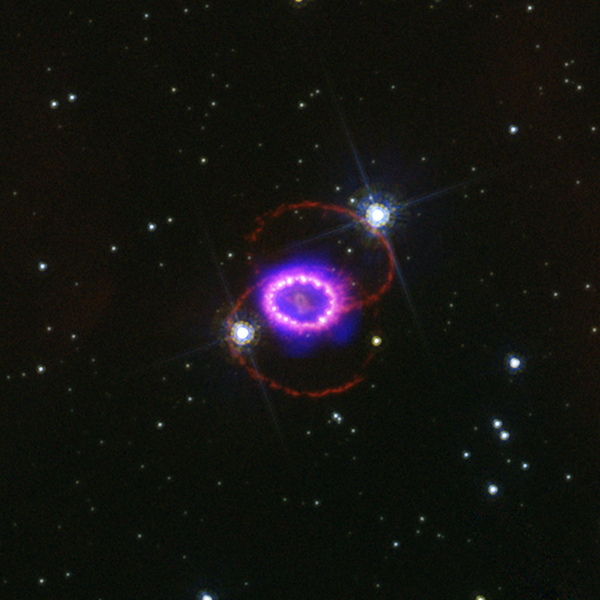 Recent Chandra observations have revealed new details about the fiery ring surrounding the stellar explosion that produced Supernova 1987A. The data give insight into the behavior of the doomed star in the years before it exploded, and indicate that the predicted spectacular brightening of the circumstellar ring has begun. The supernova occurred in the Large Magellanic Cloud, a galaxy only 160,000 light years from Earth. The outburst was visible to the naked eye, and is the brightest known supernova in almost 400 years. The site of the explosion was traced to the location of a blue supergiant star called Sanduleak -69º 202 (SK -69 for short) that had a mass estimated at approximately 20 Suns. Subsequent optical, ultraviolet and X-ray observations have enabled astronomers to piece together the following scenario for SK -69: about ten million years ago the star formed out of a dark, dense, cloud of dust and gas; roughly a million years ago, the star lost most of its outer layers in a slowly moving stellar wind that formed a vast cloud of gas around it; before the star exploded, a high-speed wind blowing off its hot surface carved out a cavity in the cool gas cloud. The intense flash of ultraviolet light from the supernova illuminated the edge of this cavity to produce the bright ring seen by the Hubble Space Telescope. In the meantime the supernova explosion sent a shock wave rumbling through the cavity. In 1999, Chandra imaged this shock wave, and astronomers have waited expectantly for the shock wave to hit the edge of the cavity, where it would encounter the much denser gas deposited by the red supergiant wind, and produce a dramatic increase in X-radiation. The latest data from Chandra and the Hubble Space Telescope indicate that this much-anticipated event has begun. 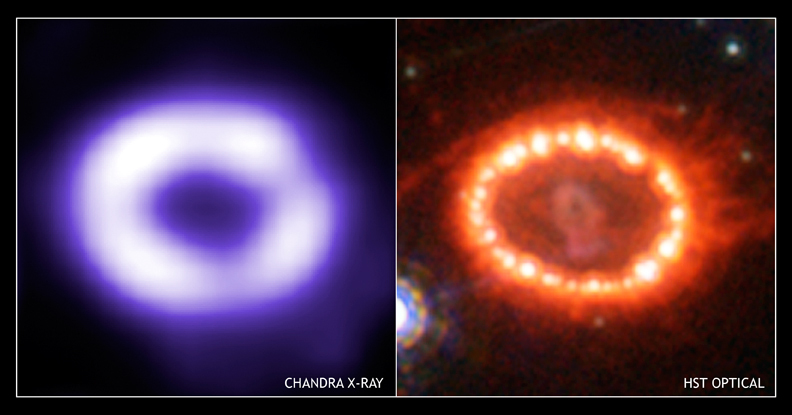 Optical hot-spots now encircle the ring like a necklace of incandescent diamonds (image on right). The Chandra image (left) reveals multimillion-degree gas at the location of the optical hot-spots. X-ray spectra obtained with Chandra provide evidence that the optical hot-spots and the X-ray producing gas are due to a collision of the outward-moving supernova shock wave with dense fingers of cool gas protruding inward from the circumstellar ring (see illustration). These fingers were produced long ago by the interaction of the high-speed wind with the dense circumstellar cloud. The dense fingers and the visible circumstellar ring represent only the inner edge of a much greater, unknown amount of matter ejected long ago by SK -69. As the shock wave moves into the dense cloud, ultraviolet and X-radiation from the shock wave will heat much more of the circumstellar gas. Then, as remarked by Richard McCray, one of the scientists involved in the Chandra research, "Supernova 1987A will be illuminating its own past." Scale Each panel is 2.4 arcsec per side.